Elite Cabins & RV Park is located just six miles east of Big Spring, Texas on the North Frontage Rd of Interstate 20, You really can’t miss the sign! From Dallas, Abilene or Colorado City, please take Exit 186. 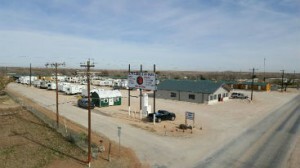 Continue going straight for 1 mile on the Frontage Road and the RV Park will be on your right. From El Paso, Odessa, Midland or Stanton, please take Exit 186. At the intersection, turn left under the freeway then left again at the stop sign. Drive one mile going west on the Frontage Rd and the RV Park will be on your right. From Lubbock or Lemesa, please take Interstate 20 on ramp going east. Proceed nine miles to Exit 186. At the intersection, turn left under the freeway, then left again at the stop sign and drive one mile west on the Frontage Rd and the RV Park will be on your right. We invite you to experience why so many travelers through the area are now choosing Elite Cabins and RV Park for their extended lodging needs. We simply hope to be your home away from home; providing a comfortable and secure stay.